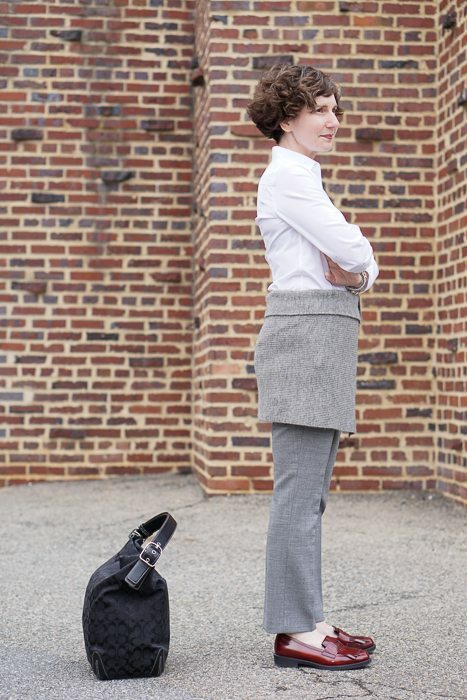 I told the photographer that I had a new idea for a series of posts: My Outfit Is Cooler Than I Am. He said, I don’t get it. What’s that supposed to mean? Perhaps you, dear readers, will show me more understanding. Have you ever put something on and thought that it was, perhaps, a little too cool for yourself . . . or your life? 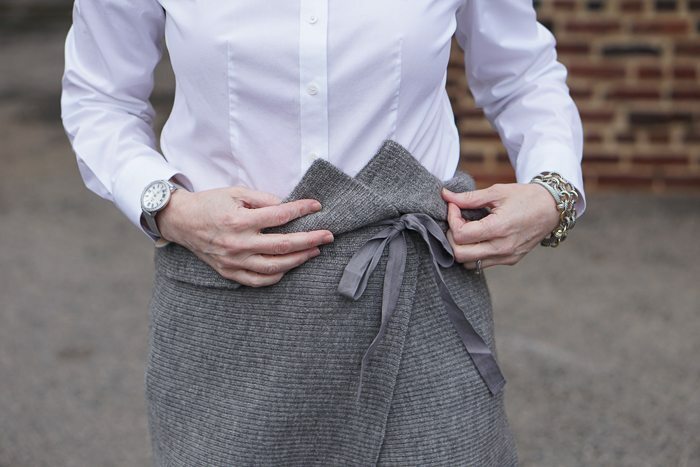 Behold an asymmetrical, wrapped, knit Isabel Marant miniskirt, styled by The Directrice. Isabel Marant is commonly described as the epitome of Parisian chic, Gallic style, and effortless cool. Other adjectives that are frequently attached to the name are bohemian, hip, edgy, understated, and (this one makes me laugh) nomadic-inspired. Warning: Isabel Marant garments are generally cut for a very thin, tall frame . . . unless they are flowing in the bohemian style, in which case they are comically oversized. They almost never fit me. But who does not long for effortless cool? Maybe you’re staring at the screen, saying to yourself, That’s not cool, Directice. You look like a librarian who’s taken a second job waiting tables. Fair enough. 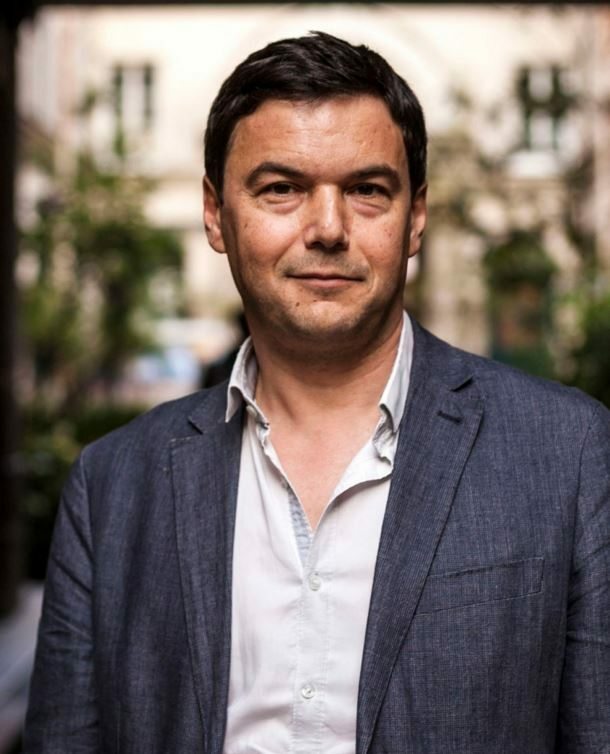 But picture me holding a Gauloises while chatting with Thomas Piketty, who is also holding a Gauloises. What if I put on sunglasses and a bit of attitude? Allow me to share my inspiration, so that even if you do not like the end product you can appreciate the process. It started with the Isabel Marant Lyneth Wrap-front Knit Miniskirt, which is clearly not appropriate (as shown right) for an office, for winter, or for my legs. I liked the apron/skirt trousers, but was hesitant to spend a lot for what are, essentially, novelty pants. 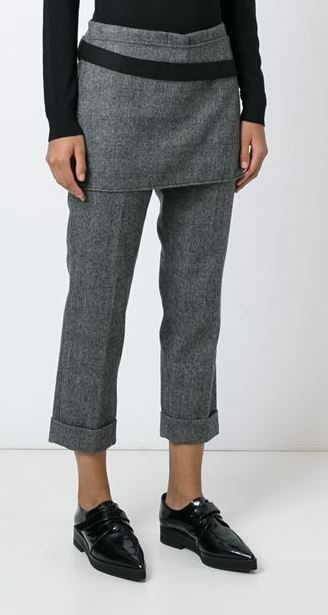 Separates seemed more practical to me. That way, if the skirt didn’t look right over worky trousers, I could wear it with yoga pants on the weekend like my astronaut skirt. I’ve long been a fan of dress-over-pants.See, e.g., Warm as Toast and Auntie Mame. 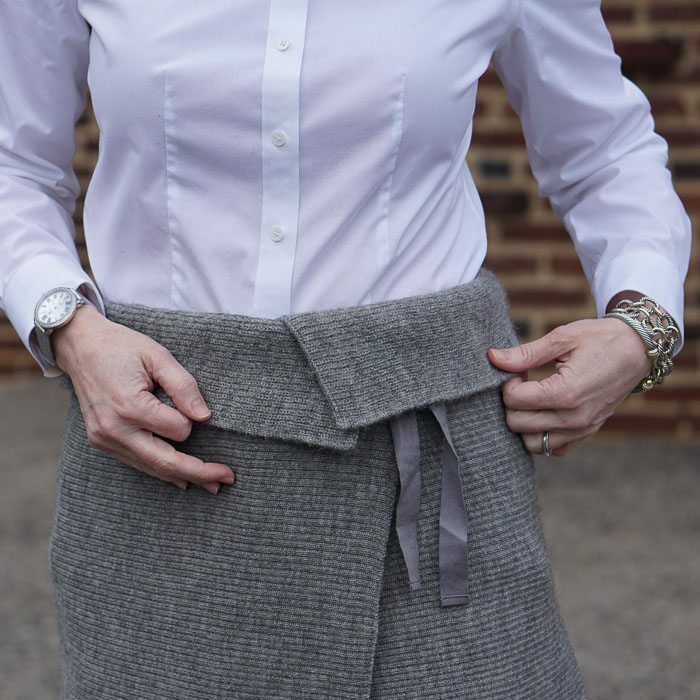 Skirt-over-pants, however, is a different, bulkier proposition. 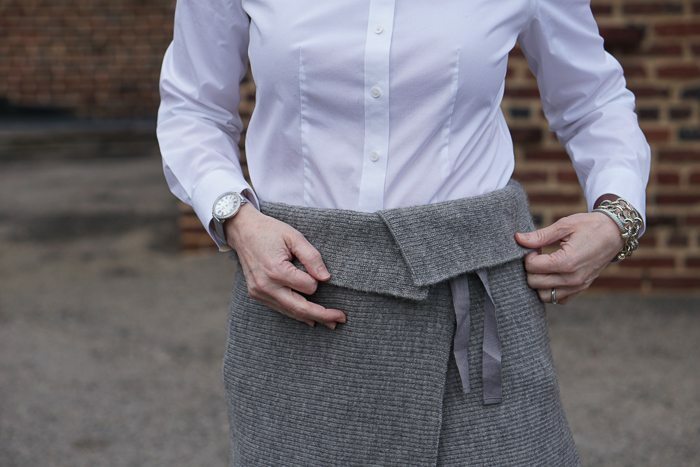 Skirt-over-pants implicates a minimum of three layers (pants, blouse, skirt), and quite possibly four (pants, blouse, skirt, sweater). But this little skirt won me over. It is bulky. Who cares? Not every day can be a svelte day. I have, however, tried to control the bulk by wearing a fitted poplin shirt. Incidentally, I think this white blouse would also look good with a black camisole underneath it. 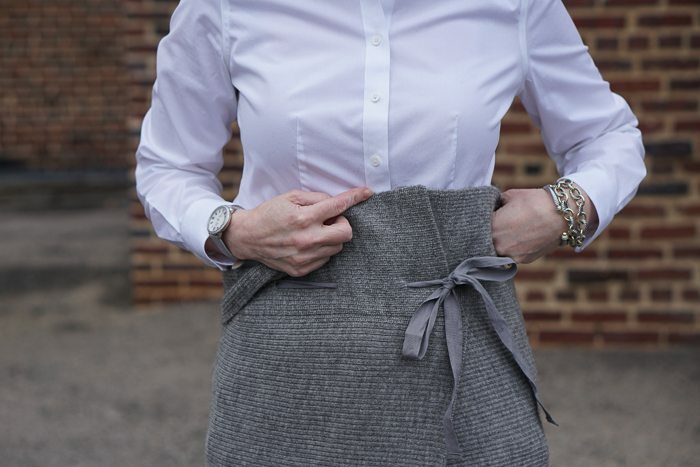 Come closer to see the skirt. 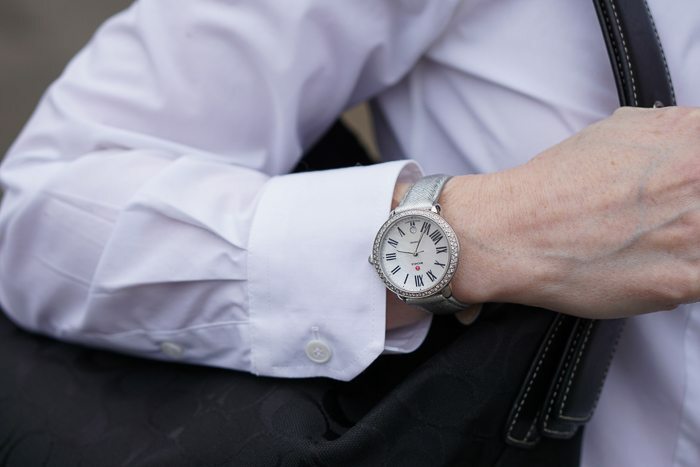 Simple jewelry and a classic watch complete the look. After much consideration, I posit: The skirt cannot be cooler than I am because I am wearing it. We are indistinguishable, and thus really cool together. I like this look very much, though would personally be tempted to place the skirt either higher, at or nearer to your natural waist, and thus synched a little closer, or lower, at true hipster height. But I may well be wrong, this may be the perfect happy medium. In any event, you look great! Thank you, Jessica! Will take your suggestion and try this at various heights. It ,”the skirt”, is definitely not as cool as you are. It looks as if you picked up a throw rug somewhere in a hasty effort to cover a stain you discovered on the lower area of your torso. and fun! This one has been most especially fun! 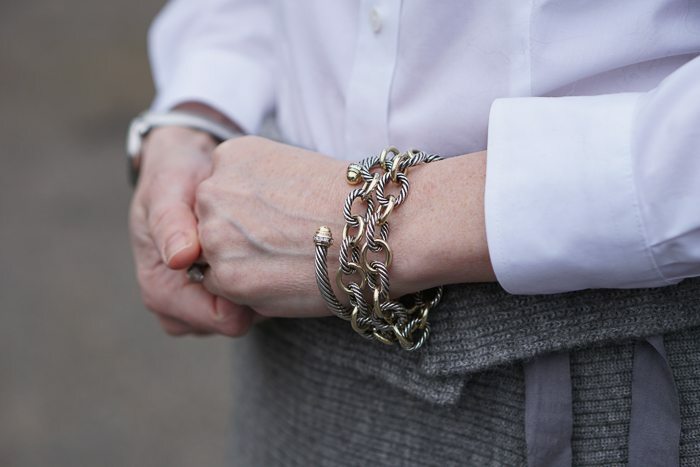 My dear Directrice — I heart this post! And I completely understood the title. Your husband is, alas, a man, and thus perhaps is not capable of understanding some perfectly obvious things. But the meaning of your post is quite obvious to me! As for the actual outfit: I must admit I’m not a fan of the skirt-over-pants genre, but I think you’ve done well within its inherent limitations. (It just seems kind of bulky to me. I mean, why not just shed the pants and go with some nice opaque black tights, you know what I mean?) Anyway, I loved the picture of you with the French attitude, that totally MADE the outfit. Dear Directrice, perhaps the skirt over thinner, monochromatic fabrics (soft black knits, perhaps) would be better. The outfit may have a bit too much going on, texturally. But you wear it well! 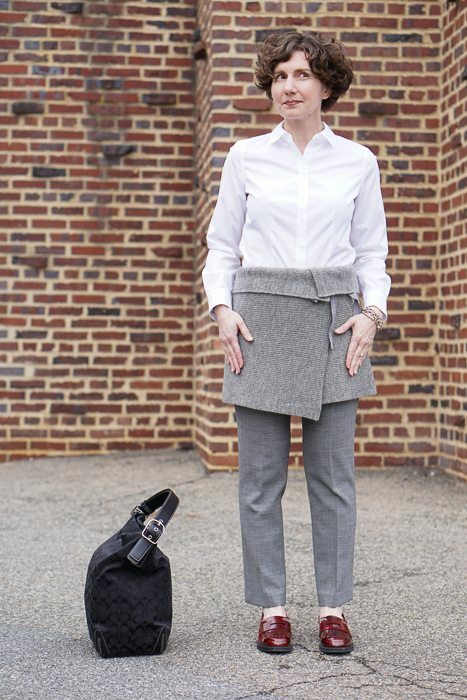 Hi Laurie — These pants have pockets, which does violate one of the first principles of dress/skirt-over-pants, which is, No Pockets. But the colors were such a match. I will try this with pocketless pants and leggings, too. I was going to say how about over leggings, but then you had the photo where we see that the pants are coming off the runway in that style. I wonder how it would look over a one color column dress. You could set it closer to your waste and pretend it’s a wooly very wide obi belt. I’m not sure how many skirts like that my wardrobe could hold. Probably I’d stick with the astronaut skirt. I love the idea of using it as a shawl! I’ll have to try it. Thank you for the suggestion, Sharla. I get it! 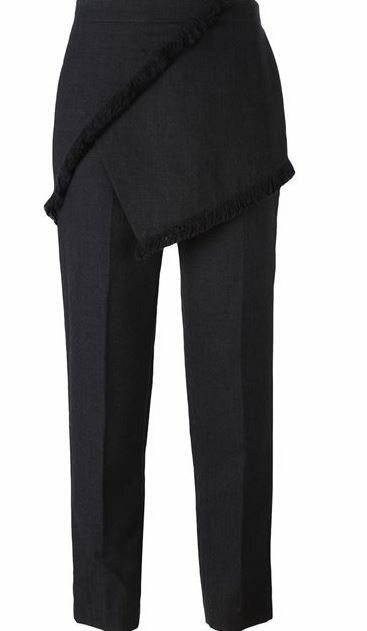 I had a DKNY cropped pants with attached apron skirt in the late 90s. I was always self conscious when I wore it, thinking that I somehow wasn’t quite pulling it off. But wore it I did, until they — notice not “it”, because pants AND and apron skirt require “they” — were stained and tired. The Directrice’s rendition is lovely, but I do agree with need for pocketless pants. I love the fact that skirt & trousers are the same colour. How about with thick wool tights of the same colour? I am glad you read my previous comment in the tone it was meant!